Definition at line 54 of file CCopasiArray.h. 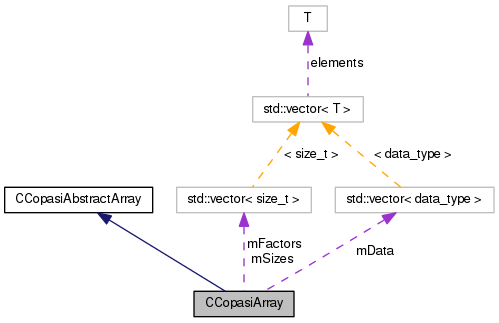 Definition at line 21 of file CCopasiArray.cpp. Definition at line 24 of file CCopasiArray.cpp. Definition at line 62 of file CCopasiArray.h. Definition at line 79 of file CCopasiArray.h. Definition at line 48 of file CCopasiArray.cpp. References mData, mDim, and mFactors. Definition at line 63 of file CCopasiArray.cpp. Definition at line 29 of file CCopasiArray.cpp. References mData, mDim, mFactors, and mSizes. Referenced by CSensMethod::calculate_one_level(), CCopasiArray(), CSensMethod::do_target_calculation(), and CSensMethod::initialize(). Definition at line 76 of file CCopasiArray.h. Referenced by CSensMethod::do_collapsing(), and CSensMethod::do_collapsing_innerloop(). Definition at line 70 of file CCopasiArray.h. Referenced by CCopasiArray(), operator(), and resize(). Definition at line 72 of file CCopasiArray.h. Referenced by dimensionality(), operator(), and resize(). Definition at line 73 of file CCopasiArray.h. Referenced by operator(), and resize(). Definition at line 71 of file CCopasiArray.h. Referenced by resize(), and size().